Whenever we have popcorn for a snack — which is often — Chris makes it with coconut oil. The other night I guess must have been particularly in tune with my tastebuds or something, because it finally occurred to me how nicely the sweet coconut complemented the earthy popcorn. And that got me thinking about a coconut corn chowder! And guess what? Coconut corn chowder is delicious. 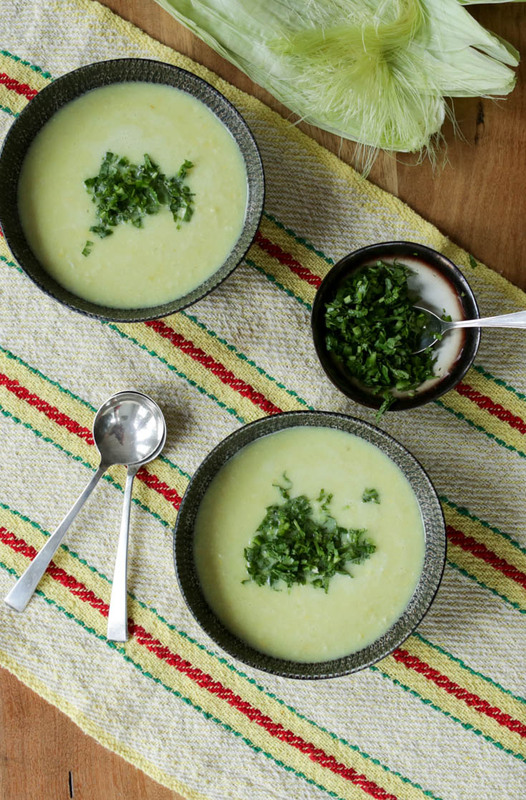 This soup is creamy and rich but also bright and zingy with a little lime zest added and a quick herb relish on top. As written, the recipe will serve two as a main course or four as a starter soup. It would really suit a Mexican or Thai-themed meal. 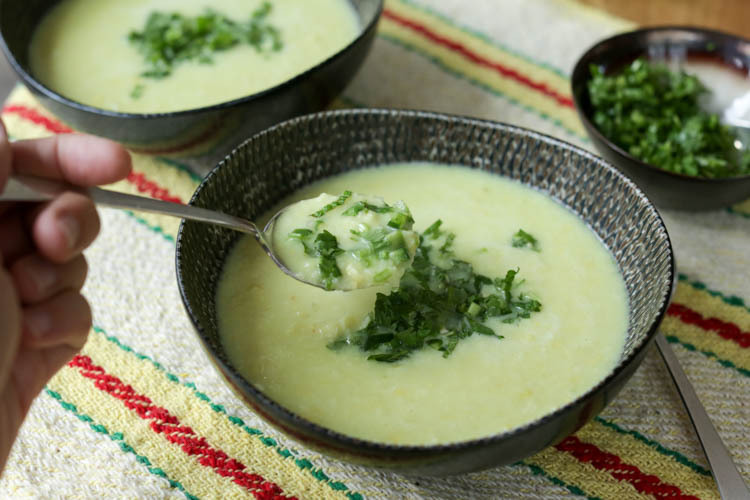 Maybe something like corn coconut chowder followed by fish tacos or vegetarian enchiladas. This soup is great served hot or cold. If you want to serve it cold (or just save a ton of cal’s, yo!) use low-fat coconut milk. If using low-fat coconut milk, saute the onion and garlic in a teaspoon of oil first instead of using the coconut fat to saute as I’ve done. P.S. You can totally serve this without the herbs on top and it is still delicious! Put the onion, garlic, and fatty top layer of coconut milk into a medium pot. Cook over medium-high heat for 2-3 minutes until onions are softened. Meanwhile, shuck the corn and cut the kernels off. Then use the back side of your knife to scrape down from tip to stem, rotating the cob, to scrape all the milky liquid from the corn cobs. Add all of that (kernels and milk) to the pot. Add remaining ingredients including coconut liquid and cover. Increase heat to high and bring to boil. Once boiling, remove lid and reduce heat to medium. Let cook 5 minutes. Meanwhile mince the relish ingredients and mix in a small bowl. Puree the soup with an immersion blender until the corn is broken up but not smooth. Serve soup hot or cold topped with relish. You might also like roasted corn salad! I was shining you on about the Chinese Chicken Salad; or, whatever/ But this may have me print out and act upon! It is true; you can/may prolong life, in a robust state by lifelong choices.